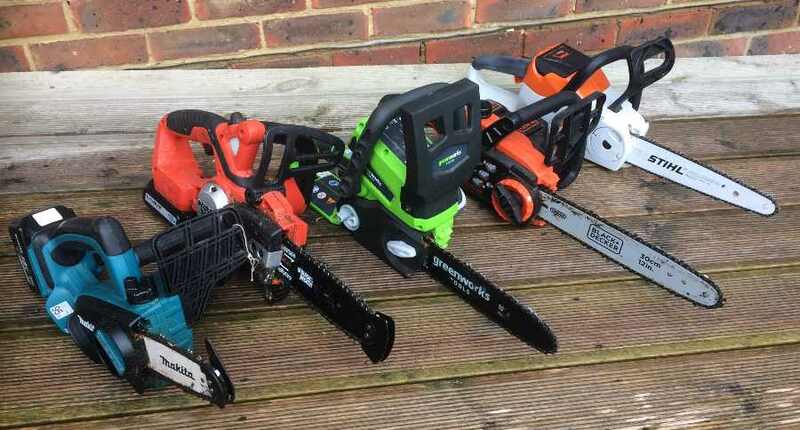 Which Cordless Chainsaw is Best? 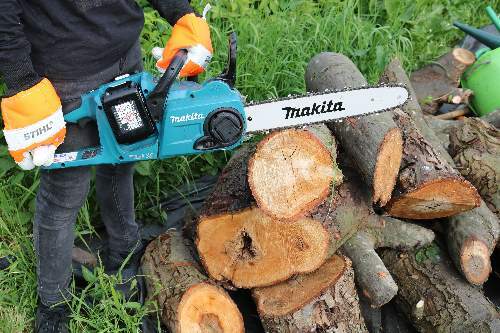 The original version of this tool was no match to my favourite 18v Makita cordless chainsaw but the new version with its larger Lithium-ion battery offers a viable, cheaper alternative. It also has a reasonable size, 25cm (10 inch) bar. The 2 amp hour, 18v battery can also be used in drills and DIY tools as well as Black & Decker strimmers, hedge trimmers, blowers and pole pruners. It should do around 20 minutes of cutting on one charge, so a 2nd battery or tool with another battery is a good option. Also lightweight but with the power to take on larger cuts and bigger jobs! At around £230 the B&D 36v saw is great value as it comes with battery and charger. 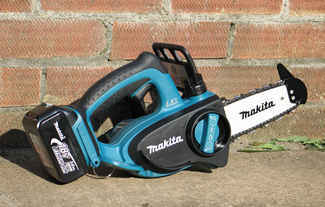 Don't expect Makita or Stihl quality but for occasional domestic use this is a very good chainsaw. It has a generous 30cm, (12 inch) bar and the 36v 2 amp hour battery can be used in 4 other cordless tools. The B&D 36v chainsaw costs slightly more than its smaller 18v brother but is a much better tool as it has a longer bar, automatic oiling, easy chain tensioning and lots more power. For the money I am very impressed with it. This model is usually sold naked (without batteries or charger) and comes with a much longer (35cm) bar than the Makita 18v saw. It replaces the Makita DUC 302Z that also used two 18v batteries but is not so well balanced and had a shorter bar. The new model has a more powerful brushless motor and an easy tool free chain adjustment mechanism. 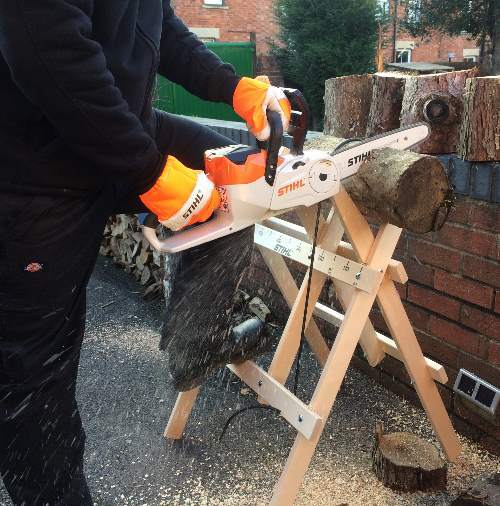 The DUC353Z 350 mm is powerful and light with all the features of a professional chainsaw. If you want to buy a chainsaw to replace a small petrol model this is the one many professionals are buying for their smaller jobs. 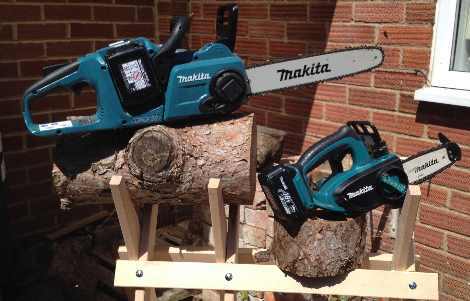 Makita saws can be powered by a range of 18v batteries such as 3, 5 and now 6 amp hour batteries to give lighter weight or longer running time. To make charging easier Makita offer a twin charger and the batteries can be used in over 100 other powertools. Less to go wrong but you do need a flat head screwdriver handy if to adjust the chain tension. The Makita DUC355PT2 is the same as the one I tested above but does not have the tool free chain adjustment. 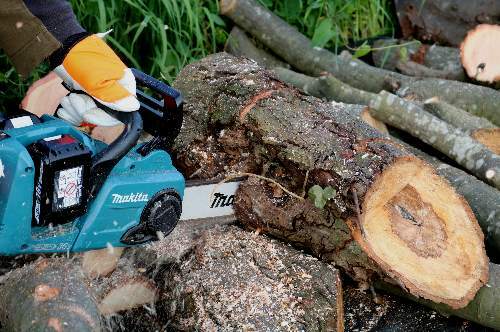 This "mini" Makita cordless chainsaw is usually sold without batteries and charger. It is a superbly made and effective chainsaw despite its unusually short, 11.5cm bar. 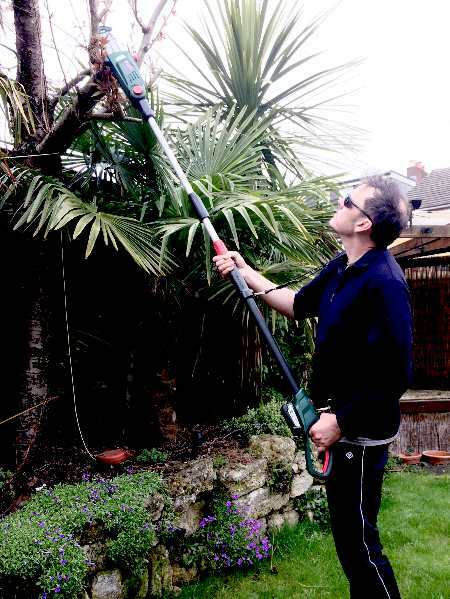 It is actually a top handled chainsaw so has been designed for professionals to use, up trees with one hand. My one is 8 years old now and only needed a cog repair after someone abused it. My Makita 18v 3 amp hour Li-ion batteries are still going strong after 8 years! If you don't already have a Makita 18v power tool with batteries then there are 2 ways to buy the whole kit. 1. Buy the chainsaw naked and a drill or other tool that comes with battery and charger. 2. Buy the chainsaw naked and the battery and charger below separately. 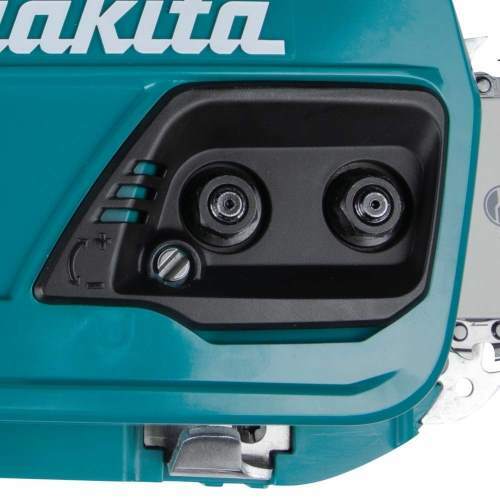 If you like Makita quality but want a longer bar and more power, the 36v model is actually cheaper to buy and runs off 2 of the same 18v batteries. The Original Model Makita UC120DWA-EX is now discontinued but batteries are still available. This new model was introduced in 2018 runs off an 18v 2.5 amp hour battery. The Bosch 18v chainsaw uses the same tried and tested 18v battery that I use in my favorite cordless hedge trimmer the AHS 50-20Li. In fact the battery can be used in a wide range of Bosch garden and DIY powertools. The 20cm (10 inch) Oregon chain runs a lot slower than a petrol or mains electric saw but it is still up to the job of sawing 8 inch hardwood logs. With the battery included it weighs a tad over 3kg and is well balanced. It has a 80ml oil reservoir and tool free chain tensioning mechanism. A full charge of the battery takes 95 minutes, an 80% charge takes 65 minutes. The chainsaw can be purchased without the battery and charger if you already own other tools in the Power4 all range. The 36v chainsaw has been discontinued but chains and batteries are still available. 2 amp hour, 2.6, or 4.0 amp hour 36v batteries available for this chainsaw. It has a 32cm (14 inch) bar and can be adjusted without tools. There are 2 ranges of Stihl 36v Cordless Chainsaws and they use DIFFERENT 36v batteries. The compact range is the lightest. There are several options for the bar length too. Due to company policy Stihl chainsaws can only be purchased from dealers and are not available online. You must collect the saw from the dealer or have them deliver it to you. Prices vary from £350- £470 depending where you go and what you can negotiate. 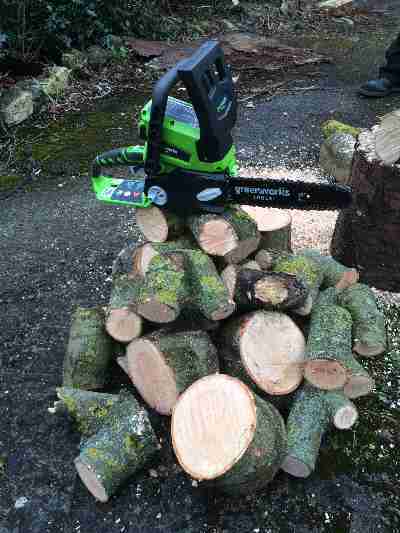 The Greenworks cordless chainsaw is slightly more powerful than the Black & Decker 18v but is similar in most other ways. It has a 25cm (10 inch) bar, which is about right for the power of the tool. The main difference is that the chain tensioning device is simpler to use. As with the B&D the battery can be used in a range of other tools too. Performance is quite impressive although the saw did stop a few times, but only on the largest logs towards the end of the job. 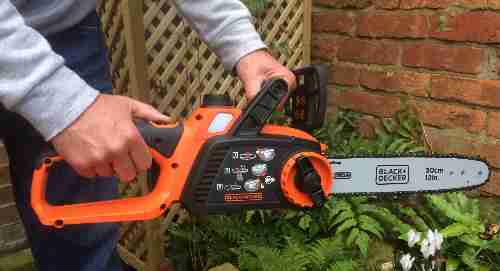 Overall this is a very good chainsaw for the money and the battery is particularly good. 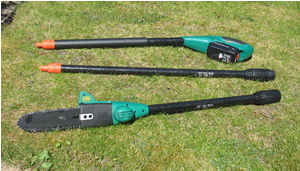 Also known as battery powered pole saws these tools can save a lot of time when pruning small to medium size trees. 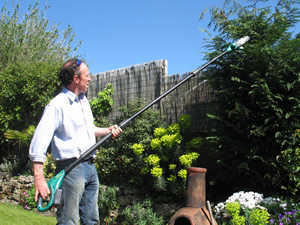 You will need to be reasonably strong but as the bar rests on the branch it is easier to use than a long reach hedge trimmer. The new 2018 Bosch 18v model is designed for domestic use whilst the Stihl model is a top quality saw suitable for domestic and professional use. This well made, no gimmicks, pole saw has a telescopic handle, shoulder strap and multi angled head. The bar is 7 inches long, the chain is easily adjusted with an Allen key and is kept lubricated by an oil reservoir. If you have a lot of trees to cut you could buy a second 2.5 amp 18v battery for around £50. Under testing now in the Fredshed garden - watch this space. This tool uses the same battery as the standard 18v B&D chainsaw. The saw comes apart for easier storage and can be used in 2 lengths as required, and extends to 2m. The 18v, slide in, Lithium ion battery can be used in the short cordless chainsaw and a several other B&D tools. The new model with Li-ion batteries is now orange coloured, not green like my old NiCad version shown above. Although this is a domestic quality machine it does the job very well. It cuts very well on branches over 1 inch but is no good on thinner stems. Also, as with any powered saw on a stick, because it uses a chain, the cut is a bit rough so take care on delicate trees. 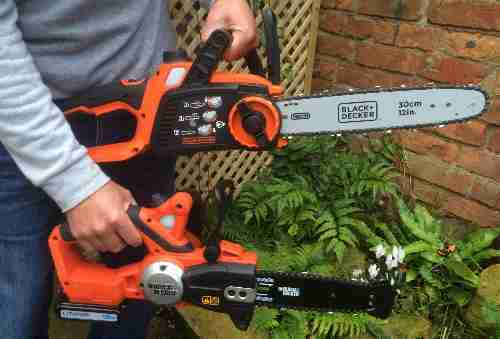 Stihl make 2 models of 36v pole saw, the smaller HTA65 is not telescopic whilst the HTA85 is and extends to 4.5m. These are professional quality, superbly made tools that command a premium price. 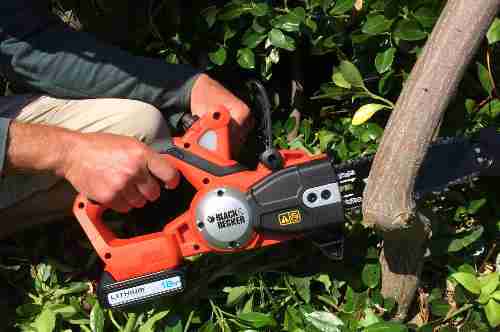 Stihl powertools are not available online so see your local dealer if you are interested. The chain tension is easily adjusted with the screwdriver supplied. You will be hard pressed to find a litre of chainsaw oil in the shops for under £10 and certainly not the superb Stihl oil. So use the links above to get a total bargain and help this site too. 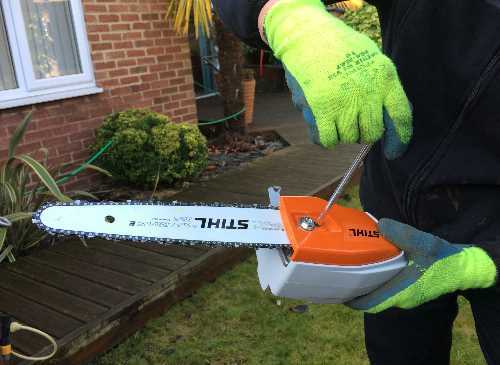 Always wear gloves, protective trousers and a hard hat with a visor when using chainsaws. Use Link below for best deal on complete chainsaw safety kit. There is no point having the best chainsaw if you don't keep the blade sharp. Chainsaw blades are relatively complex and can be hard to sharpen properly. 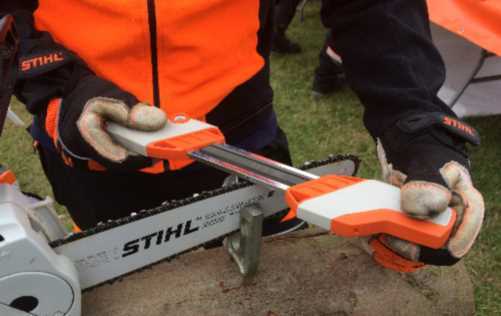 Stihl have designed this unique tool that contains a flat and a round file to sharpen both blade edge types at the same time, and at the correct angle. The Stihl sharpener can be used on any make of chainsaw blade but you must buy the corresponding sharpener for your size of blade. 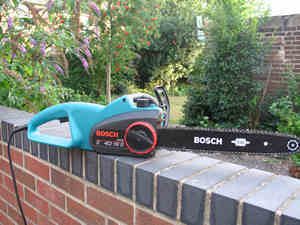 If you want to buy a corded electric chainsaw my recommendation is Bosch. 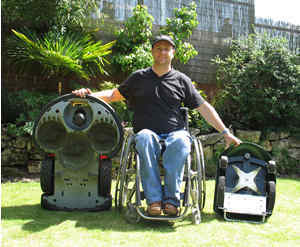 They have a wide range, good performance and can be easily contacted for spares and repair. The saws have no fancy gimmicks and all the features, including tool-less adjustment of the chain on the higher end models. 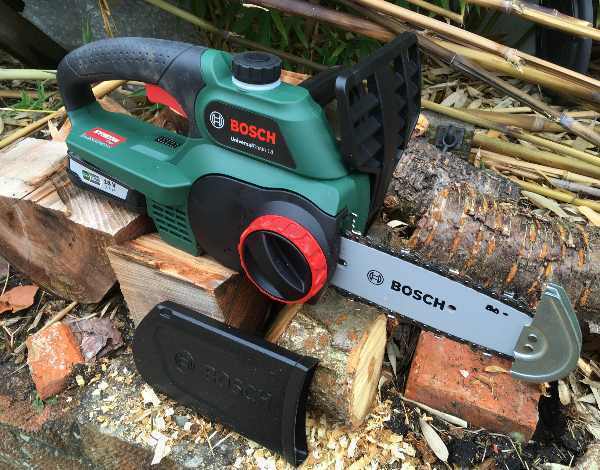 Another good feature of the Bosch chainsaws is the longevity of the range which means that spares are also going to be around longer. 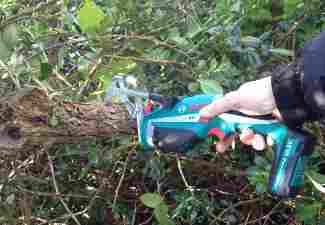 With the right blade a cordless reciprocating saw can be great for pruning, especially in tight spaces! The universal blades are cheap to buy and easy to change. If you can run a cable then a mains powered saw will be cheaper to buy and more powerful. The Ryobi one+ battery can also power a telescopic pruner that uses the same universal blade fixing. 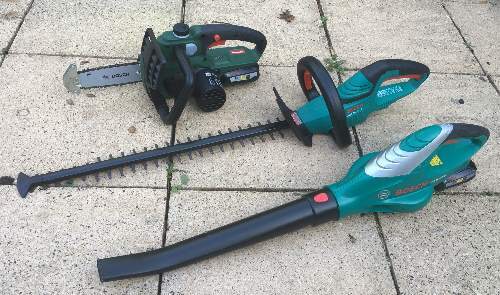 For tree pruning you can buy some excellent blades that are longer than the usual carpentry blades, cheap and have larger teeth spacing to cope with soft green wood. I use this tool all the time now and if I need to cut hard dead wood then I swap to the shorter, finer tooth carpentry blade. 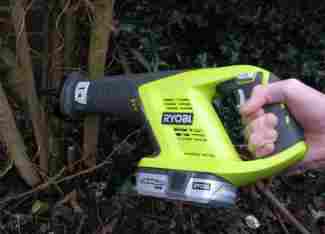 The same 18v Ryobi battery can also be used in their long reach pole saw. This superb little saw is lightweight yet surprisingly powerful thanks to its 10.8v Li-ion battery and clever gearing. I have used it extensively to prune trees and to cut up old branches and building timber for my wood burning stove. A range of blades are available for different materials and I am particularly impressed with the metal hacksaw blade. There are a couple of little things I don't like about it; firstly the battery is built in and secondly the connector to charge it is hard to insert. If you can live with these 2 small issues then it is a very handy tool. 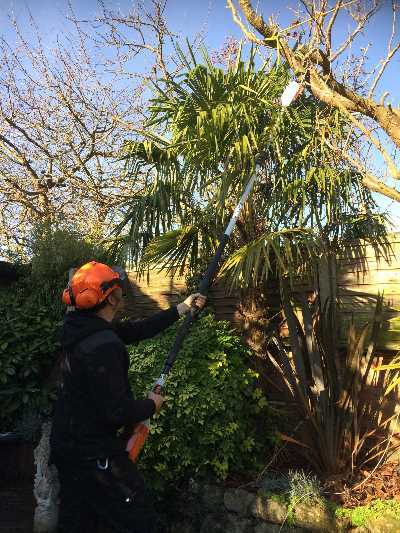 The removable metal guard that holds branches is particularly useful and once you get your technique right you will be able to cut branches up to around 4 inches thick with ease. Despite its relatively small battery the Bosch Keo is a tool that punches well above its weight!